The rare cosmic triple play of Jupiter, Uranus and the full moon this week is dazzling amateur astronomers with a bright night sky show. Jupiter, Uranus and the nearly full Harvest Moon met in a rare cosmic lineup late yesterday (Sept. 22), just two days after Jupiter made its closest approach to Earth in nearly 50 years. Wednesday night's sky show also occurred on the equinox, marking the official start of the fall season in Earth's Northern Hemisphere, and spring in the south. If you missed the sky show, don't despair. 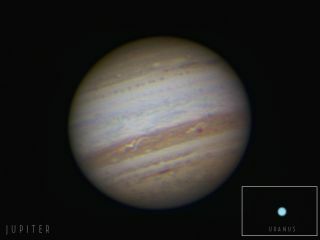 Jupiter will continue to be a bright skywatching target for several weeks, according to the skywatching website Spaceweather.com. Through a small telescope, the brilliant bands of color from the turbulent atmosphere of Jupiter were unmistakable, Eubanks said. At the time, Jupiter was 3.95 astronomical units, or AU, from Earth. One AU is the average distance between Earth and the sun, about 93 million miles (150 million km). "It's quite a surreal experience to view an object that is so far away and know that you are watching weather on another planet," Eubanks said. He used a Meade 8-inch SCT telescope? to capture his photos. In Arizona, amateur astronomers were also treated to clear skies, serving as the perfect stage for Jupiter and Uranus. Photographer Jin Lu in Tempe did not expect a good view of the planets. The telescope he and his friends were modifying with a new camera wasn't ready yet. But he pointed his Nikon D90 camera with an 18-105 mm lens to see what he could see on Sept. 19. "Jupiter, its moons and Uranus were just there," Lu said, adding that the weather was perfect for viewing. "The fourth moon, Europa, was too close to Jupiter and could not be seen." Lu also snapped this long-exposure photo of Jupiter, which shows the planet's movement across the sky in front of a sea of stars. In the Phoenix suburb of Gilbert, Ariz., skywatcher Pat Jameson did not have a telescope, but still made a point to look for Jupiter after reading about its close approach on SPACE.com.? "I had never pointed binoculars at any celestial body other than the moon ? and I was stunned to see three pinpoints in a straight line through the middle of Jupiter," Jameson said, adding that it was clear they were Jupiter's moons. "Amazing, with all the ambient light of the city, I could still see them. How cool is that?"